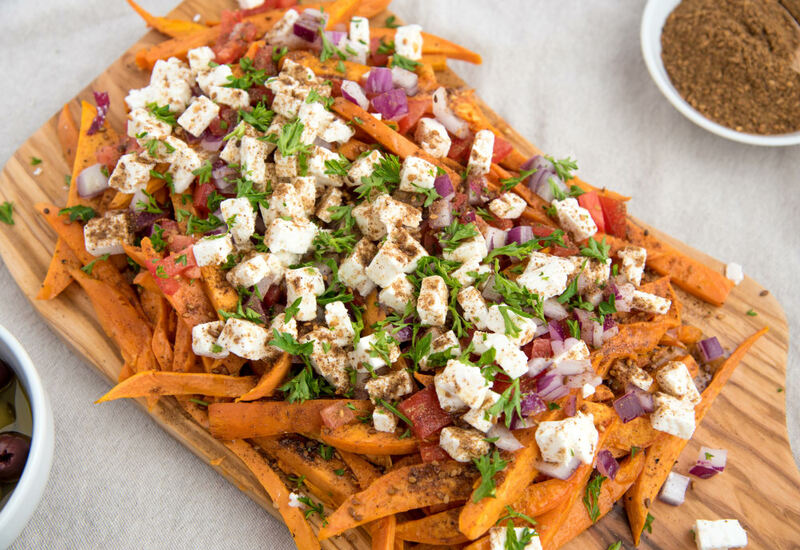 Invite your friends over for game-day or a casual gathering, and surprise them with these healthy and delicious feta cheese sweet potato fries. Sweet potatoes are rich in fiber, vitamins and minerals, and baking them in the oven instead of deep-frying means they're extra good for you. Topping the potatoes with the Mediterranean staples of salty crumbled feta and savory zaatar spice blend results in a flavor-packed dish that's full of contrasting textures. Diced red onion, tomato and chopped parsley add a zing of freshness. Trust us, you won't be able to have just a few! Zaatar is widely used in Middle Eastern cooking, and has a tangy flavor with intense aromas. Every region has their own version. Typical spices include a blend of oregano, sumac and toasted sesame seeds. Find it in spice shops, Middle Eastern markets or online. Per Serving: 468 calories; 23g fat; 56.9g carbohydrates; 10g protein; 33mg cholesterol; 684mg sodium. These loaded sweet potatoes fries were really good! I put zaatar on everything, so delicious! Perfect game day recipe! These remind me of loaded Mediterranean fries! Very good, delicious. I love sweet potato fries, these were like a piece of heaven.